Product #18057 | SKU LP36055 | 0.0 (no ratings yet) Thanks for your rating! 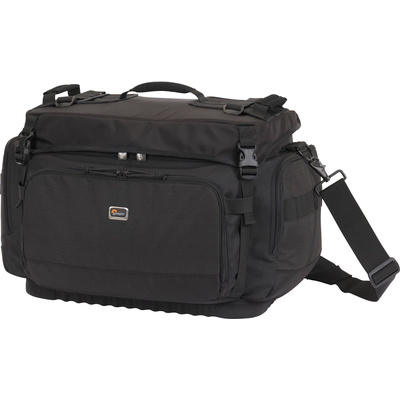 The Lowepro Magnum 650 AW Shoulder Bag (Black) is designed to carry 1-2 Pro digital SLR camera bodies with 70-200 F2.8 attached to one, 8-10 additional lenses, flash, accessories and a widescreen notebook computer with a screen up to 15.4". It has a notebook sleeve with an integrated sunshade that can be used at the top of the bag for an impromptu work platform or it can be carried separately using the included handle. It is constructed from water-resistant fabric with 1-piece foam framed padding and a Velex polyurethane and 210 denier nylon lined interior. There is an exterior moulded base that offers sturdy and stable protection, water-resistance and stackability. The internal dividing system provides a flexible structure to accommodate lots of gear in various configurations. The Magnum 650 AW has a quick-access organisation pocket, 2 side pockets, a removable accessory pocket, laminated mesh organisation pocket inside the lid and a mesh ID pocket on the lid. There are also 3 attachment loops that can hold SlipLock accessories and metal D-rings for other clip-on items. The bag has removable cinch straps on the top of the bag that can carry a monopod or small tripod. It has a rain-flap lid with lockable zipper that protects the contents from the elements and an All Weather AW Cover that surrounds bag and provides additional protection from the elements. The bag is carried by 2 padded hamper handles, a centred padded grab handle and a removable, adjustable Vertebral Tech shoulder strap with pad. There is a Trolley Sleeve that slips over the handle of many rolling carts and removable, adjustable handcart straps on back panel to fit other wider handles.